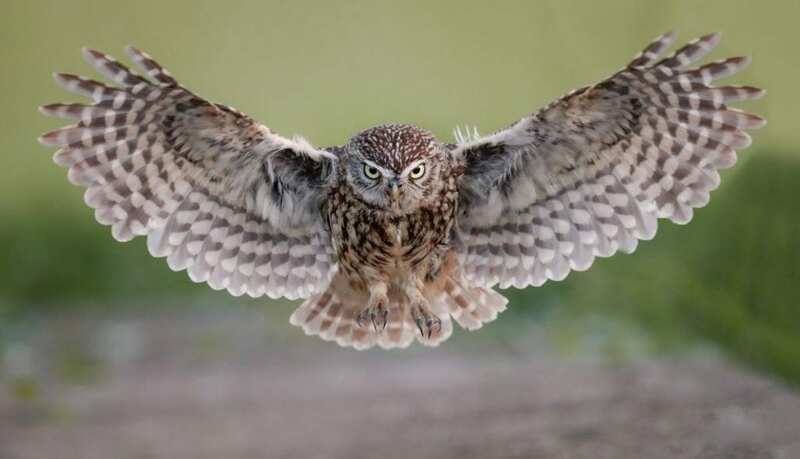 The winner was Simon Wantling from Northants with his amazing sharp shot of a little owl swooping in. Simon explained how it took months of fieldcraft to get the picture: “An image like this is the result of many weeks and months work out in the field, monitoring the owls. 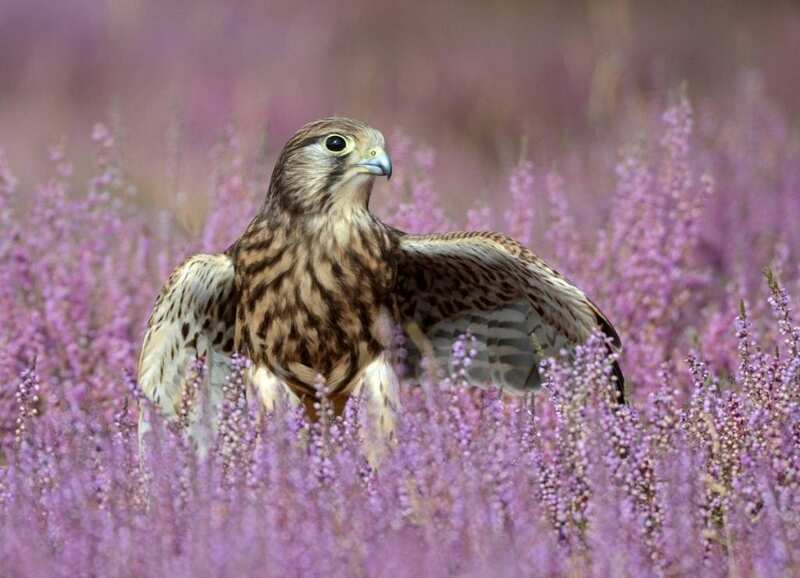 Runner up was Eric Browett with a close portrait of a hawk on heathland near Tunstall in Suffolk. 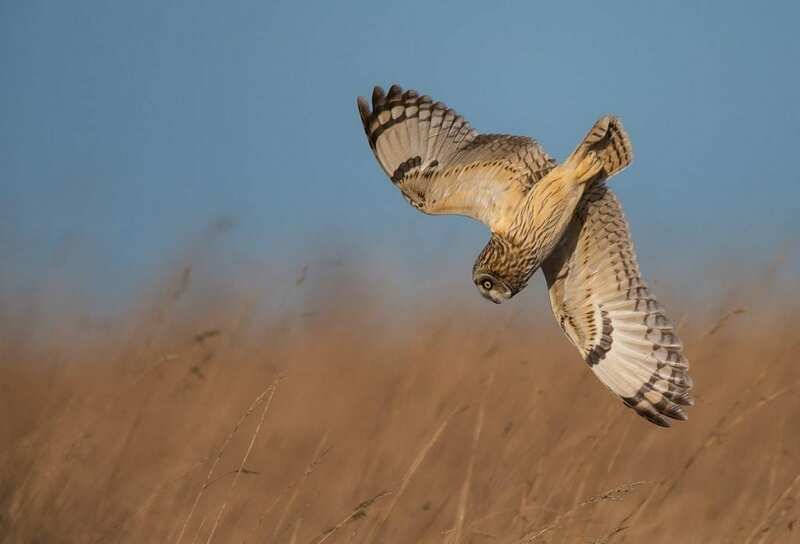 And another bird of prey scooped third, a diving Short-eared Owl in Gloucestershire, captured by Andy Howe, a civil engineer from Bedford. He said: “There had been a heavy frost the night before and the the car was telling me minus four. “When I arrived at the site there were no sign of any owl activity so I got my equipment together and patiently waited. “As the sun rose above the horizon a pair of Short-eared owls appeared. Amongst the more than 1,500 entries were many highly commended shots from all over the globe. All entry fees were donated to the RSPB. 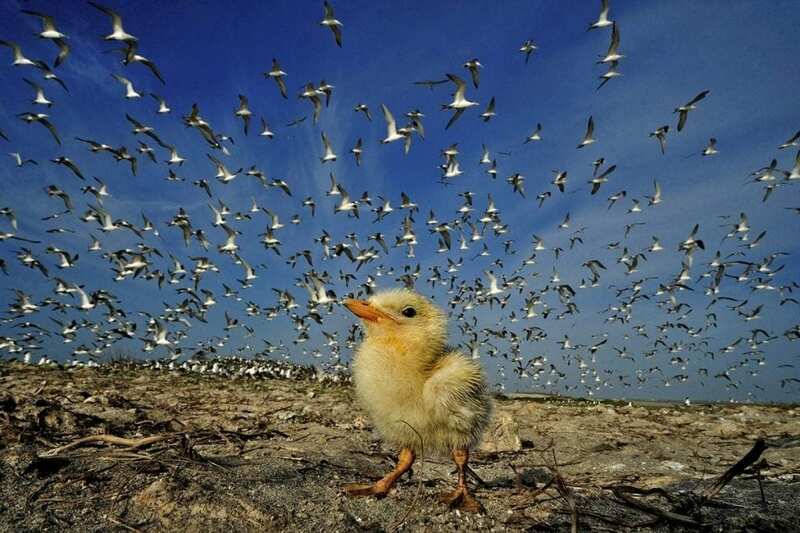 Lalith Ekanayake, a doctor from Colombo in Sri Lanka told how he got a stunning shot of a Greater Crested Tern chick on the northwest coast of his homeland. He said: “The picture was taken after a few days of effort in extremely hot and humid condition with no shelter whatsoever. 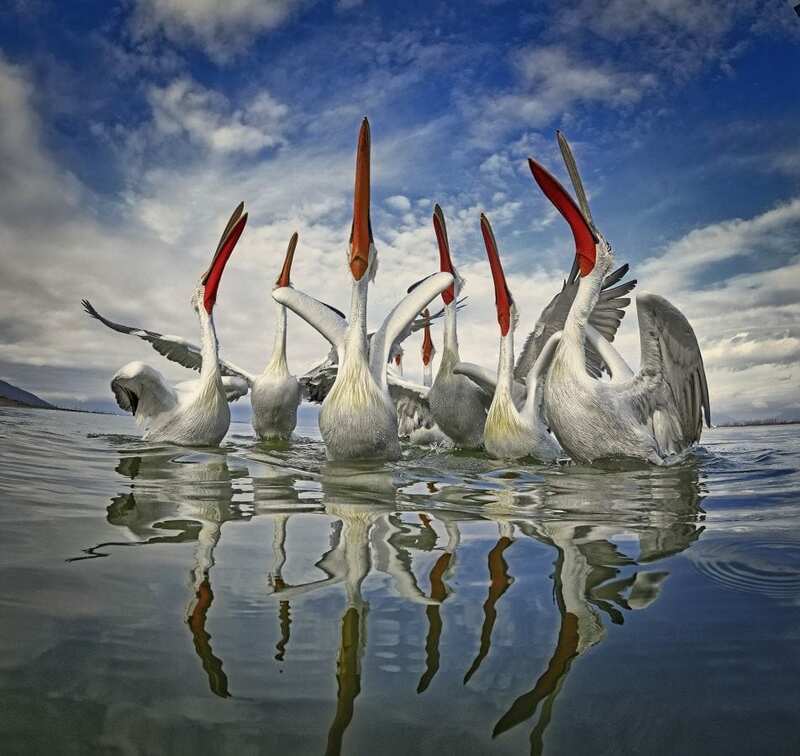 Easier to get and also highly commended was his shot of pelicans at Lake Kerkini, Thessaloniki in Greece. At the same location, Tracey Lund, a 44 year old network maintenance engineer from Hull got a different shot of the pelicans eating fish. Nesting sites proved to be popular places to get great shots as these other highly commended pictures show. Jacques-André Dupont from Montreal went to Bonaventure Islands on St-Laurent River, Quebec, to photograph the largest northern gannet colony in North America with 100,000 birds. 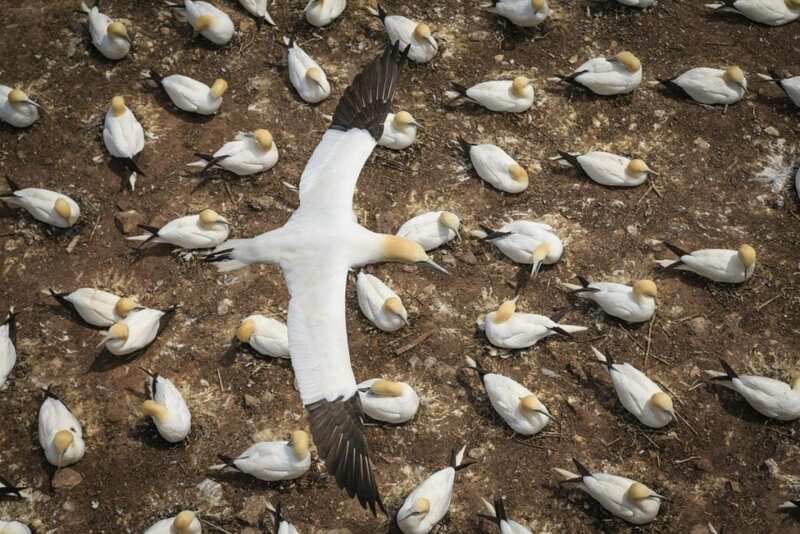 He said: “This particular image shows a top view of a gannet coming back to the nesting area, trying to identify its mate amogst the thousands of evenly spaced nests – quite a challenge. 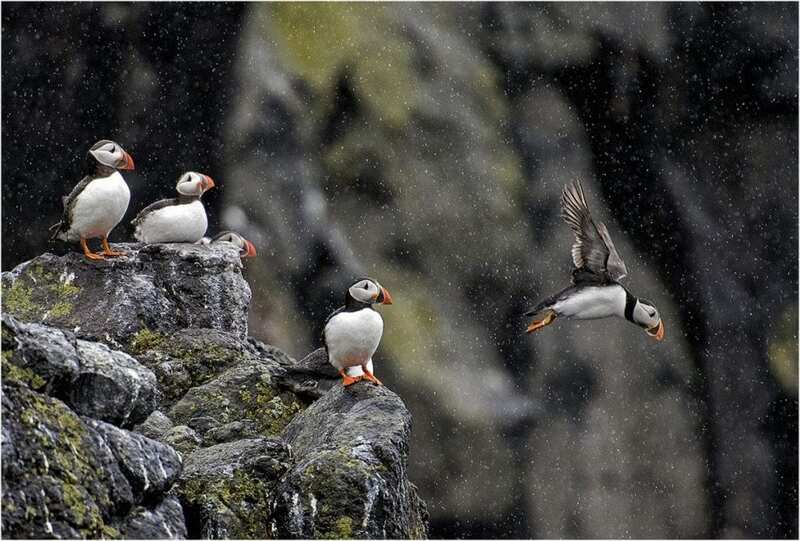 And retired biology teacher Ken Wilkie, 59, from Glasgow, went to a puffin colony on the Isle of May in Scotland where tens of thousands breed and stood in the rain for hours to get his picture. He said: “I wanted to catch a puffin launching off the cliff to go and catch sand-eels to feed its young, so I waited at the cliff’s edge for a couple of hours in the pouring rain hoping to catch one jumping. “They are incredibly fast moving and you have to watch them intently as they can jump at any time, without warning. 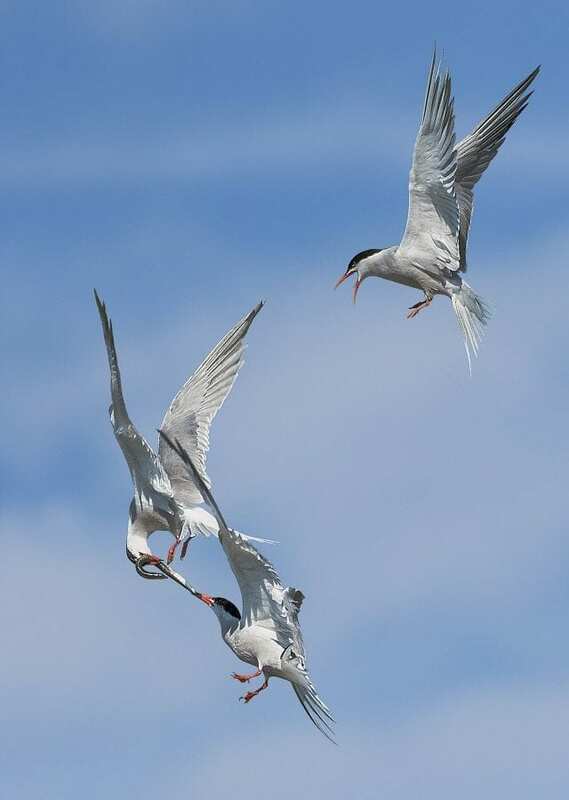 Seabirds turned out to be good subjects as this highly commended shot of three terns fighting over a sand eel in midair by Keith Malcolm shows. 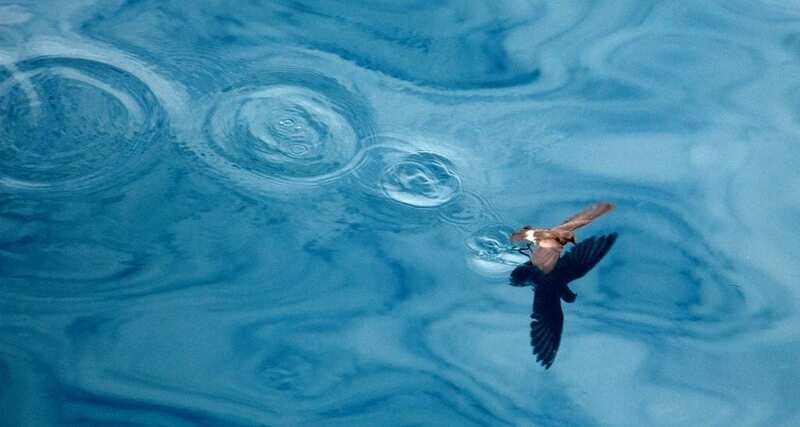 Also highly commended was this picture by Andrew Mills of a storm petrel skimming the water off the coast of Isabella in the Galapagos Islands. He said: “I tried many unsuccessful attempts to photograph one but they move rapidly constantly. “This was taken from a boat and it just caught the ‘walking on water’ action with the pools of ripples showing where it had walked. 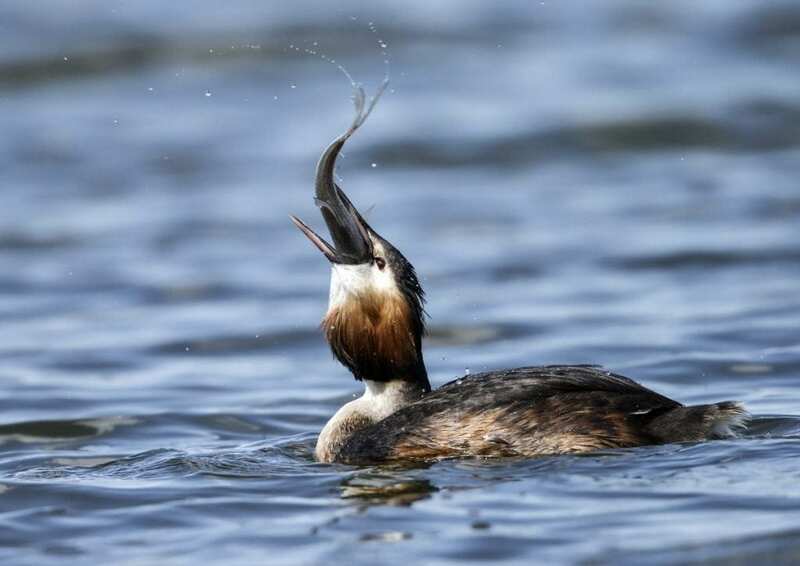 Inland, water still seems to play a large part in photographing birds as this Great Crested Grebe gobbling a fish by George Foster shows. He said: “The photograph was taken at Calf Heath Reservoir, near Gailey Island on the A5 near Cannock. Amateur photographer Gary Bree, 68, from Chalfont St Peter in Bucks, travelled to Scotland to photograph the ospreys of Aviemore. Speaking of his highly commended picture which took him four days to get, he said: “I would be up and our of my hotel room by 3.30am and on location by 4.00am, set up and hidden from the Ospreys’ view just above the waterline within 15-20 minutes. 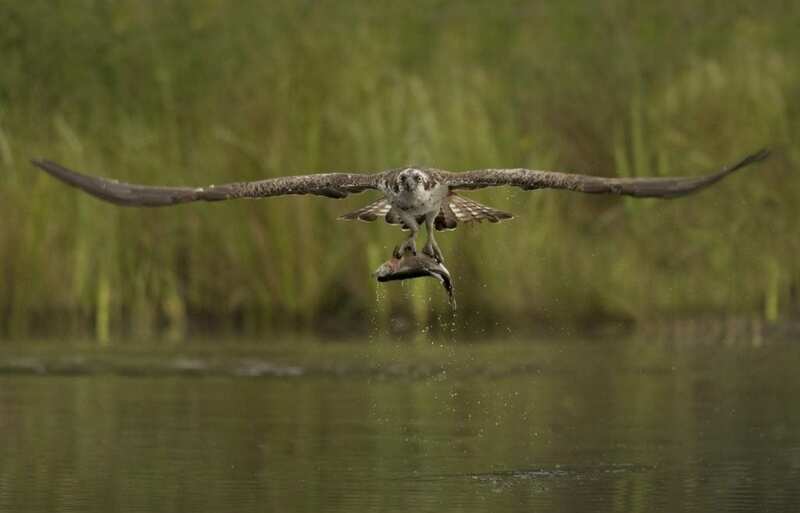 “On my fourth day I heard the splash of the Osprey hitting the water. “I hunted for him through my telephoto lens and spotted him as he struggled with his heavy capture wriggling and trying to escape the grip from the his talons. “He began his journey diagonally at me. He was heading straight for me. That is the picture you now see, the view, the sound was breathtaking. 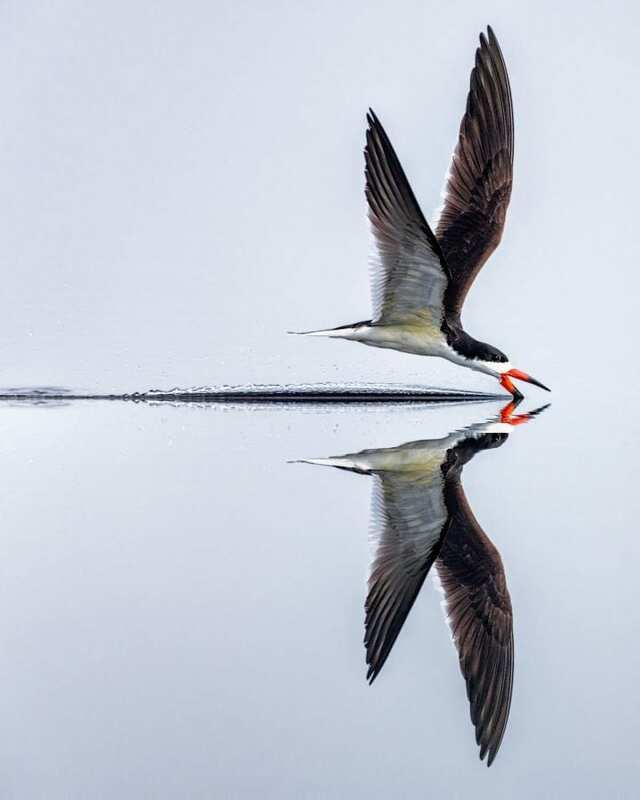 This amazing reflective shot of a Black Skimmer, was taken by retired wildlife biologist Richard Higgins, 67, in the northwestern panhandle of Florida. Richard said of his highly commended shot: “I photographed the Black Skimmer in the early morning. cks came about as all the birds gathered at a warm spot in the pond during a freezing winter in Romania. 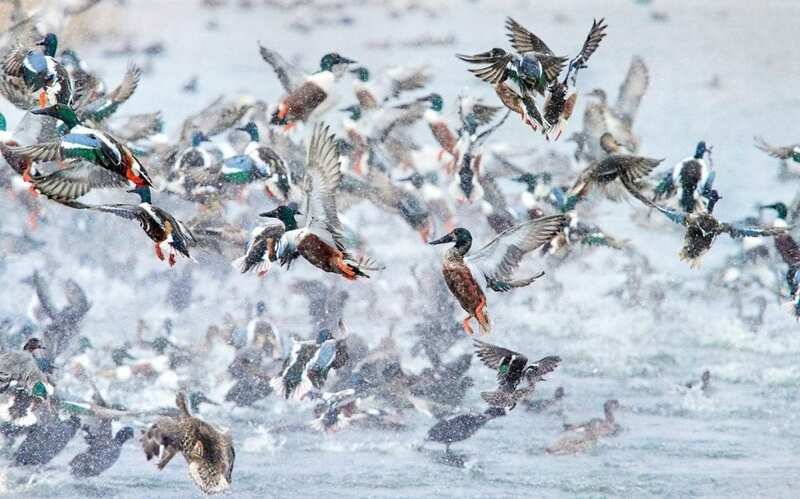 Photographer Diana Buzoianu, 42, said: “We had been astonished to see this pool of warm water in the midst of the frozen landscape as all the birds found a momentary sanctuary. “Although certain species would not stay so close to others, we have seen on this occasion a rare spectacle where they had to live and survive next to each other during this winter snap. 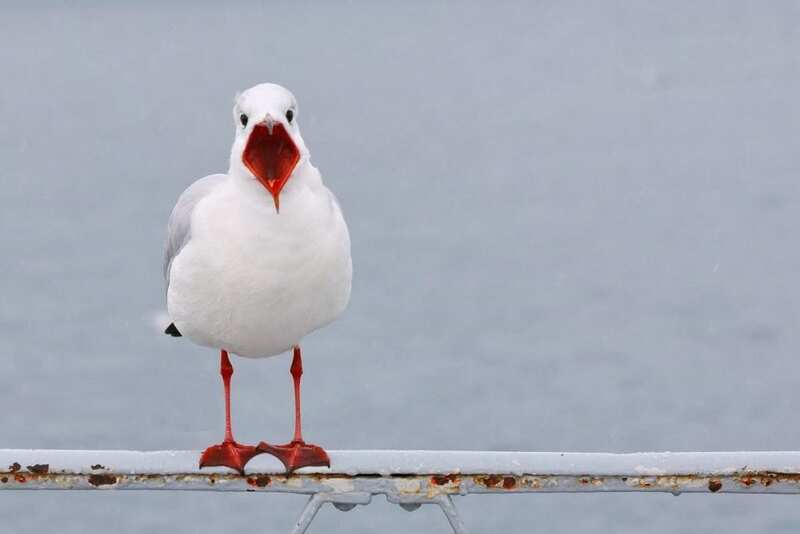 Some of the birds featured in the competition look quite comical, such as this bigmouth seagull on the shores of Lake Geneva by Michael Schwartz and Mike Spence’s quirky Wood Pigeon shot in Conwy, north Wales. But for sheer poise and colour, this highly commended shot of a Green-crowned Brilliant Hummingbird would be hard to beat. 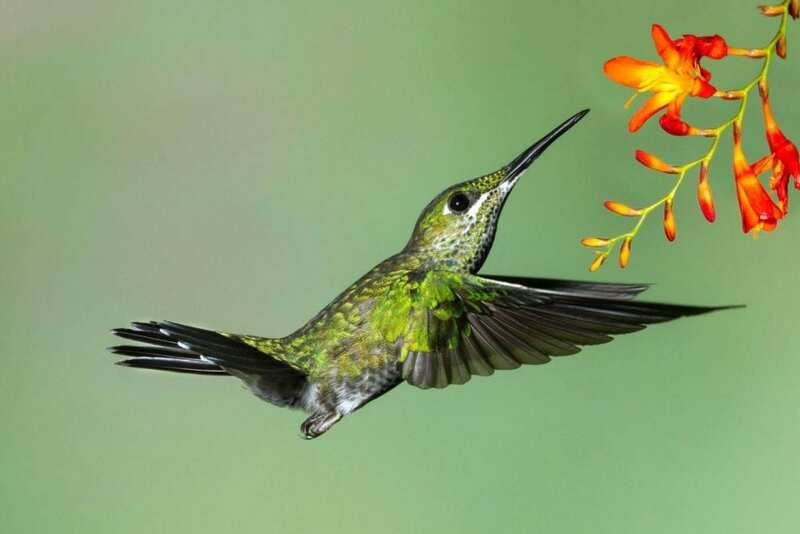 Photographer Richard Winston, 70, a retired teacher from London said: “I took this shot in Costa Rica. 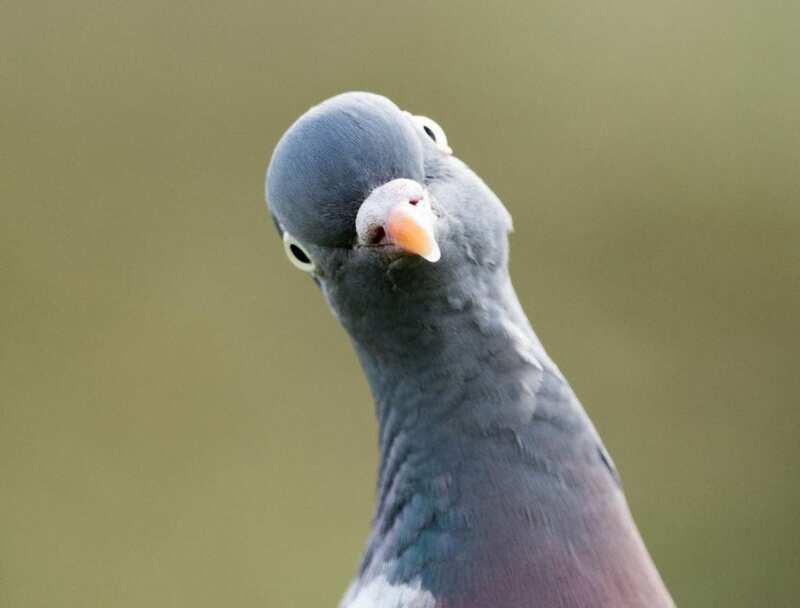 The judging was done by a specialist team consisting of bird and ornithology experts Jon Ashton and Charles Farnell, chaired by Mike McNamee, an international nature salon chair for more than a decade. On the winning image Mike explains: ‘’The focal plane was absolutely nailed, so the eyes and forward facing claws are extremely sharp. “The photographer also caught the turbulence of the deceleration perfectly in the feathers.